I lived in East Africa for eight years of my life and I have very fond memories of the food there. 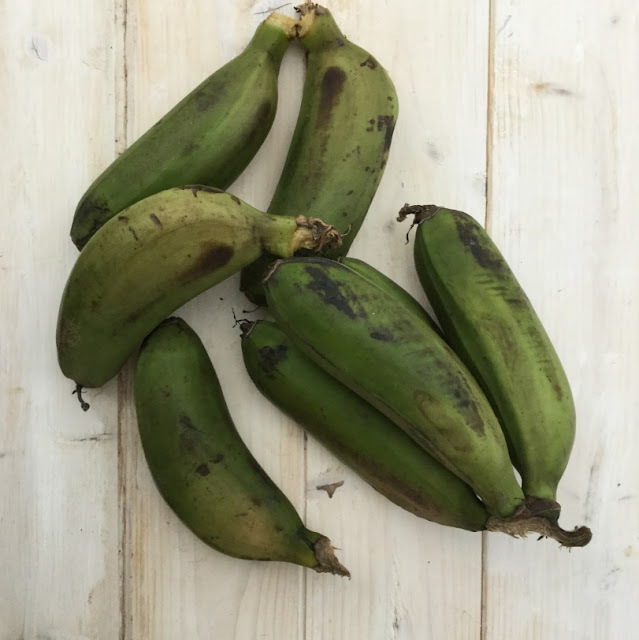 Street food was something we loved and I have a very vivid memory of one such street vendor who used to daily serve the Matoke (green raw banana) right outside my school gates. It was a simple dish but as they say its simplicity at its best and sometimes uncomplicated dishes are the ones that have the greatest taste. Coming to the Matoke Bhel, it was simply matoke boiled in their skins, the vendor would then fish them out of the simmering pan and peel and mash them into a tin dish. He would add lemon juice, salt, chilli powder and a dash of oil and mash it all together. The matoke mash was then transferred to a serving dish, it was topped with thin slivers of red onion, finely chopped chillies and a generous helping of a crunchy snack called chivda (a spicy fried beaten rice, potato crisps and peanut mixture). Finally it was finished with a garnish of finely chopped coriander leaves and served with an extra squeeze of lemon juice and more sprinkling of chilli powder for those who liked it spicy!! The spicy tangy flavours and the crunch from the toppings made this streetfood snack the best thing I have ever tasted. I fact my mouth waters every time I think of it. I have tried to recreate this dish again in my kitchen and it was definitely the best thing I have eaten. I can't believe I waited so long to prepare this amazing streetfood snack. 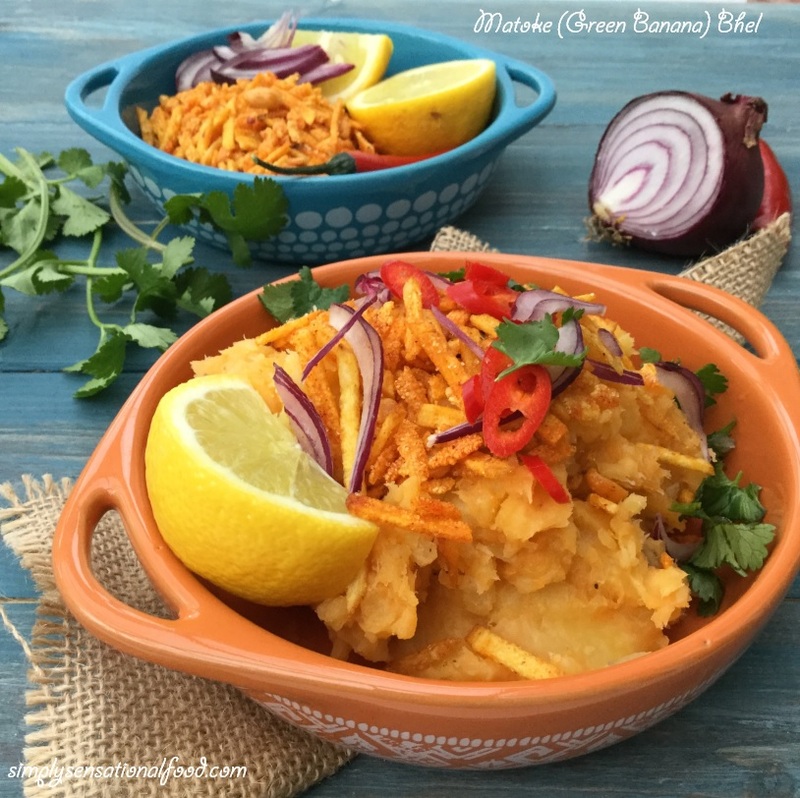 African Street food boiled matoke flavoured with simple spices and garnished with onions, chillies and a crunchy savory snack topping. Place the matoke without peeling in to a large pan of water and boil for 20 minutes, you can see the matoke are ready when the skins start to split open. Once the matoke is boiled remove from the pan and peel the skin off. Place it in a bowl and mash it with a potato masher. Add salt, chili powder, lemon juice and the oil and mix well. Transfer the seasoned matoke to two serving bowls and garnish with the onion slices, the chivda and the chopped coriander. Serve hot with extra lemon wedges. If you dont have any chivda you can just add some potato chips scrunched and some roasted peanuts instead. I am sending this recipe to an event hosted by Mirelle of The Schizo Chef to celebrate African Food week. I really believe in healthy eating and I always try to include lots of healthy ingredients into my daily diet. For centuries it is thought that foods have healing properties and having Indian roots , I always grew up in a household where my grandmother and my mother would feed us all types of foods to keep up away from illnesses and ailments. I too try and follow this thought and try and include natural ingredients in my cooking that have healing properties. 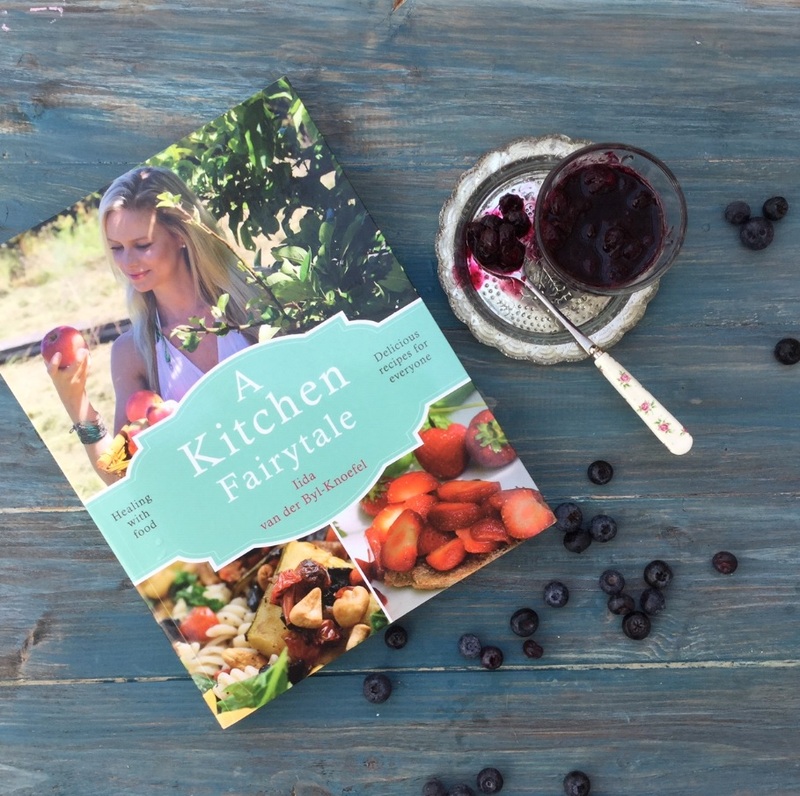 Recently I came across a book called A Kitchen Fairytale.What is special about this book is that the author Iida van der Byl-Knoefel wrote the book after changing to a plant based diet to help her recover from a serious auto immune condition. The book supports the Paddison Program for Rheumatoid Arthritis. 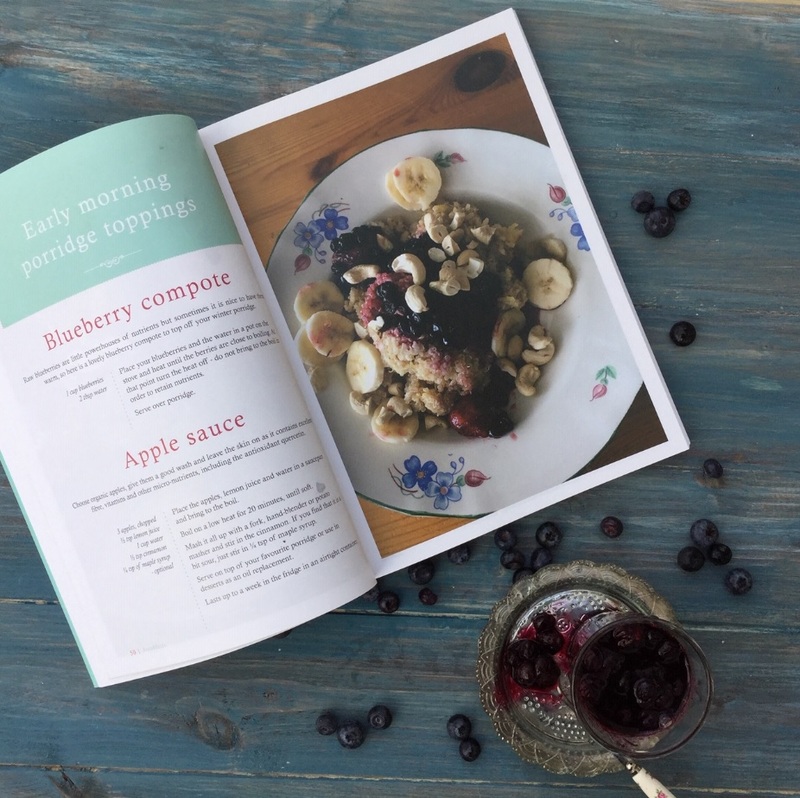 All the recipes are predominantly wholefood and plant based.The recipes are low in fat, sugars and salt and she uses whole grain, legumes and fruits. In the first few pages of the book Iida shares how the changes in her diet together with yoga helped her to overcome her health issue. It is extremely interesting and unlike a standard cook book Iida shares a wonderful story of her journey to recovery. The Kitchen Fairytale Cookbook has a selection of recipes, all categorised in chapters such as breakfast, mains and desserts and drinks. The recipes are easy to follow and the book is beautifully illustrated with mouthwatering photos. I have tried many recipes from the book. The recipes are uncomplicated and simple to make but are really tasty. The best thing is that most ingredients used in the book are all readily available in the supermarkets. 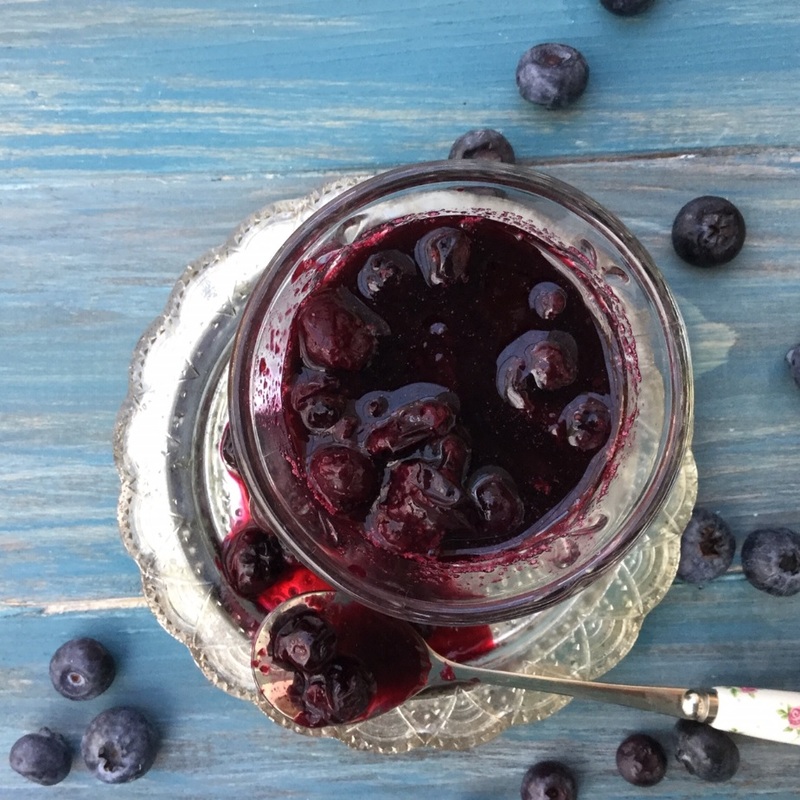 One of my most created recipe is the blueberry compote, I would not say its really a recipe as its just blueberries cooked in water, but you will be surprised at the burst of flavour you get with the compote compared to just adding blueberries to your breakfast. It just takes the humble porridge to new heights in taste and flavour. You can purchase the book from Amazon and most large book shops. The month of February I was allocated Mirelle's blog theschizochef . I am very familier with Mirelles blog as I have been visiting it for anumber of years. Mirelle used to actively participate in my flavours of series and create and carve series. What can I say about this Amazing blog? There is a recipe from every nation you can think of and the choice is so big that it was super hard to choose what to make. 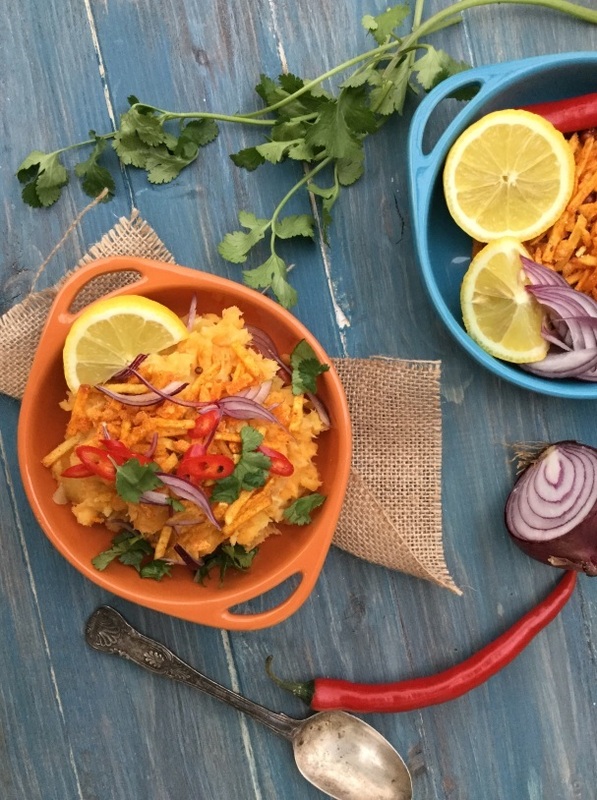 Ater spending hours looking through the recipes, Iwas particularly drawn to Mirelles African inspired recipes as I was born in East Africa and some of her recipes evoked lots of childhood memories. 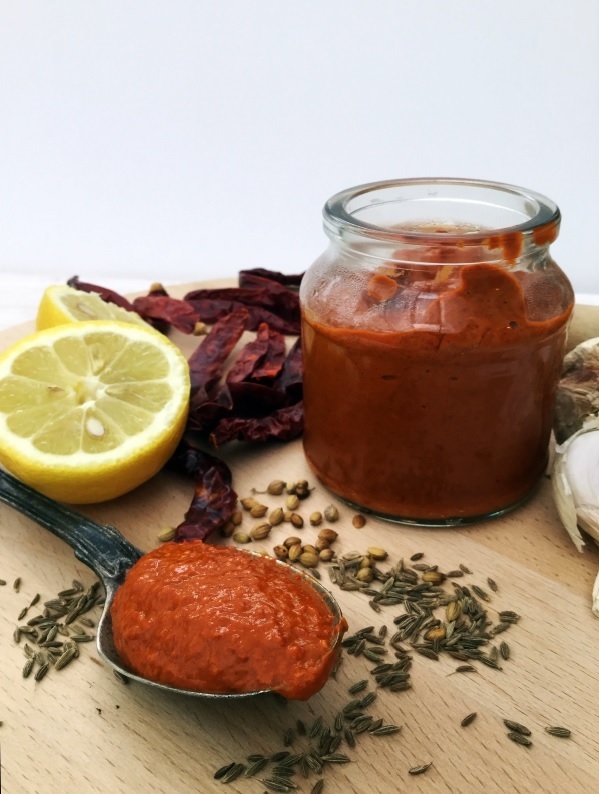 After short listing something like 10 recipes, I finally settled on her home made Harissa recipe as I love spicy marinades and this Harissa paste has so many uses. I followed the recipe exact to her instructions, only exception was I reduced the quantity to make one jar full only. A spicy North Afican Red Chilli and garlic paste that is perfect for marinades and using as a dip when added to yoghurt and mayonaisse . In a dry skillet, roast the coriander, cumin and caraway until fragrant. Let cool. Using a spice grinder, grind to a powder. Drain chilies, reserving a little of the liquid. 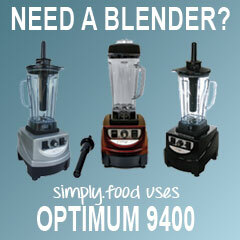 Add all the ingredients to a blender jug like the Optimum 9400 and blend to a smooth paste. If the consistency is a little stiff add a little more of the liquid that the chillies were soaked in. 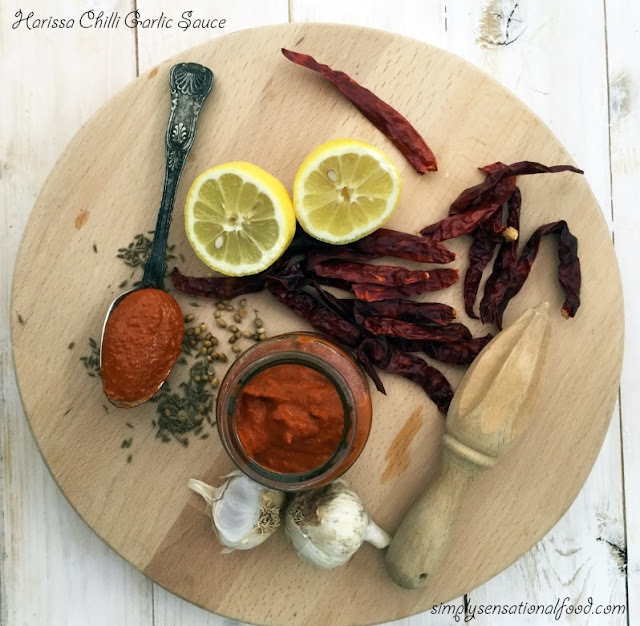 Transfer the Harissa to a sterilised bottle and keep refrigerated. 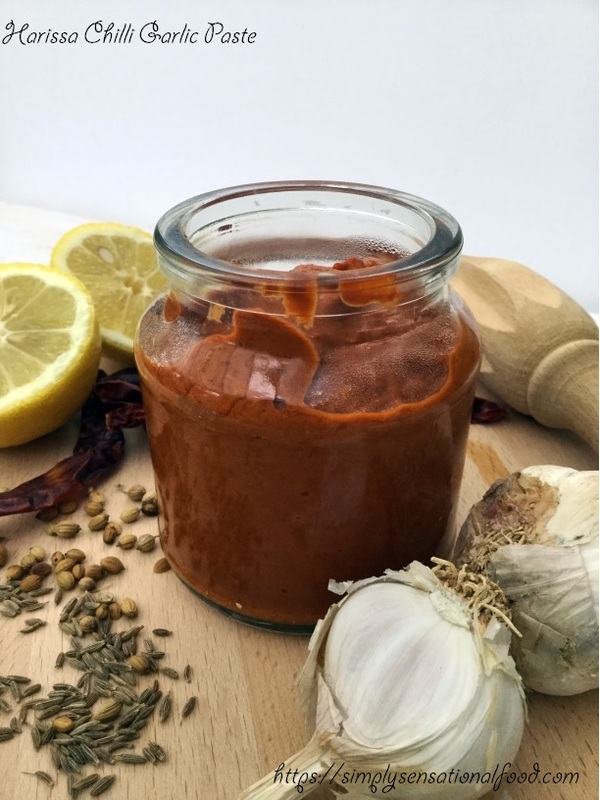 I made my Harissa sauce in my Optimum 9400 Blender and it blended it to a lovely smooth paste in seconds. The blender is so versatile and powerful that it grinds, pulses, makes ice cream, soups and amazing smoothies and nut butters too. It is easy to clean and maintain too. 30 day no quibble return/ exchange policy if you are not satisfied with your purchase. You can also get an extra £30.00 off by putting AMB1572 £30.00 OFF IN COMMENTS BOX when ordering. What is afternoon tea you may ask? Its actually a meal that is usually consumed between 3.30 and 5.00pm and originated in 1840 with the wealthy social class in England. The meal consists of mini cakes and pasteries, delicate sandwiches and scones with jam and clotted and of course English Tea. The afternoon tea was a ritual amongst the wealthy and it was always served in bone china and porcelain cups and saucers and had a finesse about it. 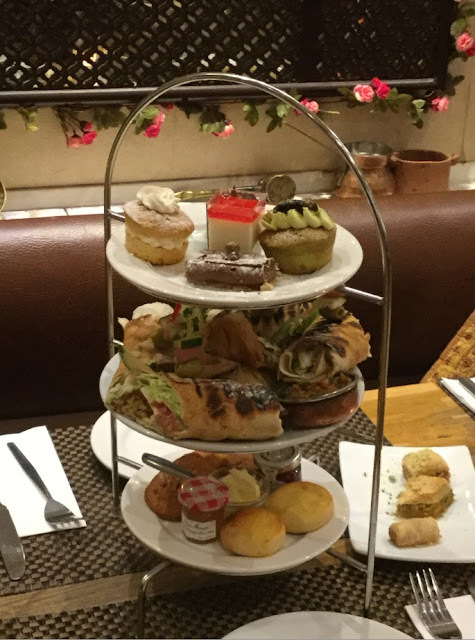 In this day and age afternoon tea is not a daily occurance due to our busy lifestyles and way of life and it is now more of an outing once in a while as a treat. Many well known hotels nowadays still host elaborate afternoon teas for their guests. These teas are very British inspired and traditional. 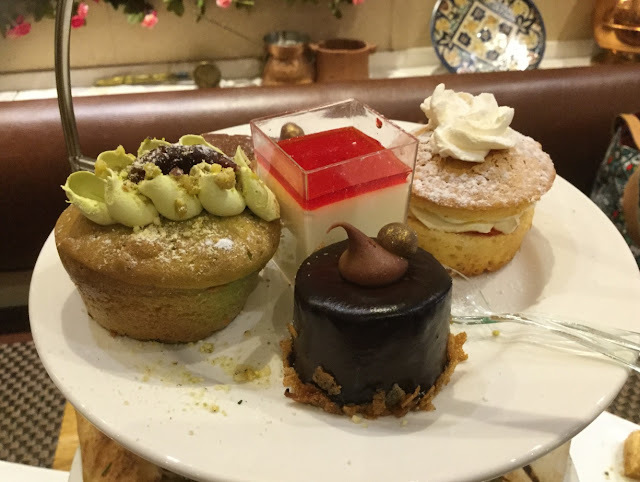 This week I had the opportunity to sample a different type of afternoon tea. It was in fact a Moroccan afternoon tea at the Leila Restaurant in Ealing. 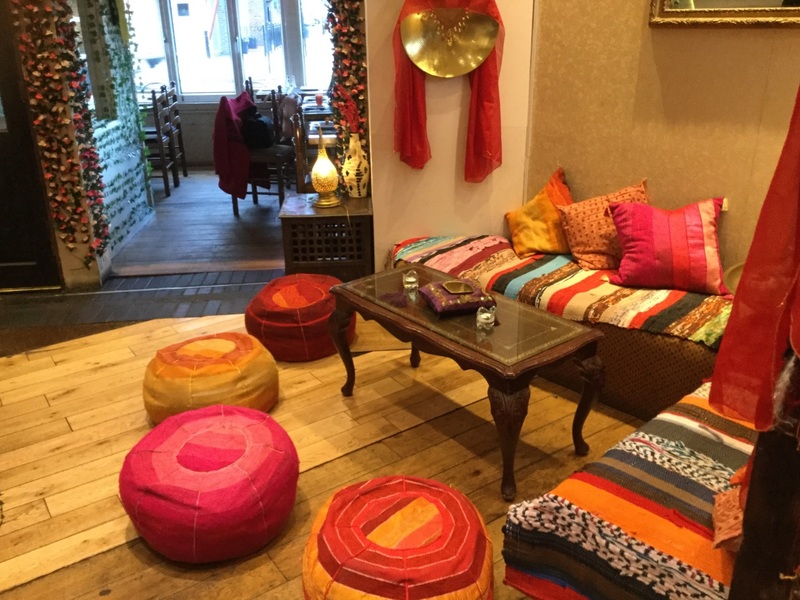 Leila is a quaint little restaurant in Ealing, beautifully decorated with Moroccan artefacts, rugs, cushions and lighting and lamps. 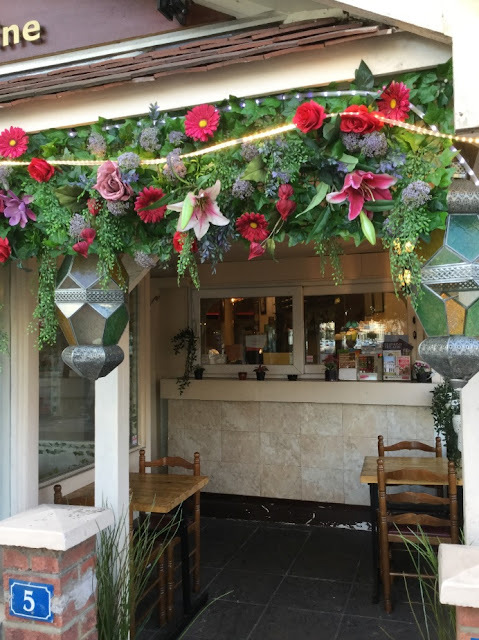 It has a really pretty conservatory at the front of the restaurant that has a very authentic middle Eastern decor and ambience. 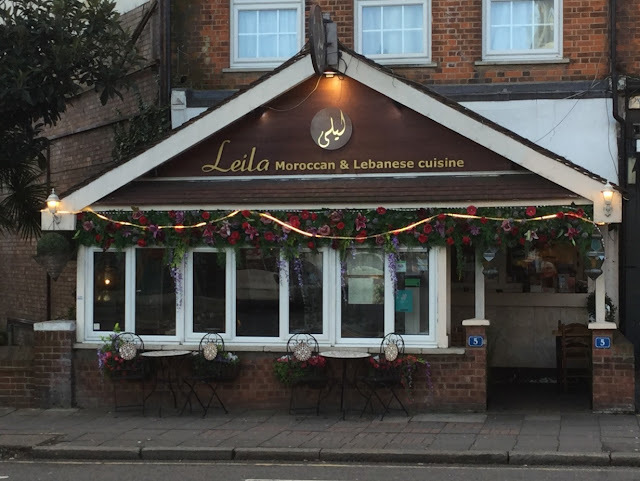 Leila has kept the afternoon tea concept, but introduced subtle Moroccan flavours in the cakes, pastries and replaced sandwiches with wraps . 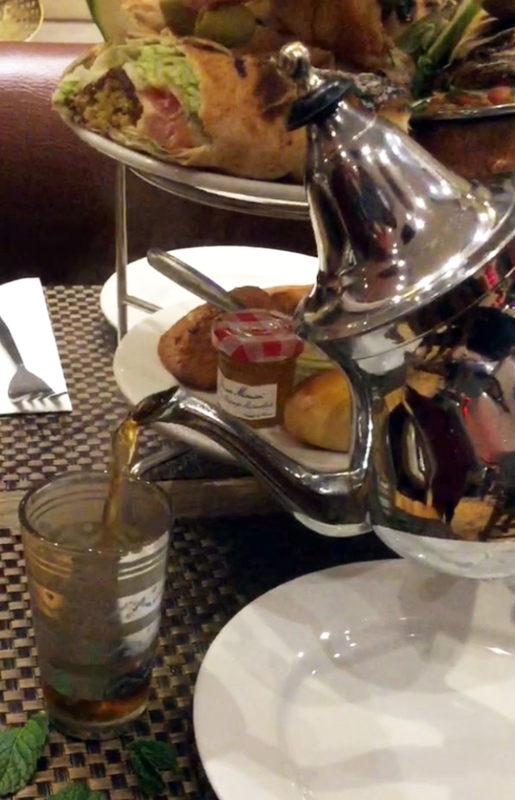 They also serve Moroccan mint tea instead of English tea to compliment the flavours. Leila also offer meze so we were rather fortunate to have the opportunity to sample some of the Meze dishes before tucking into the afternoon tea. 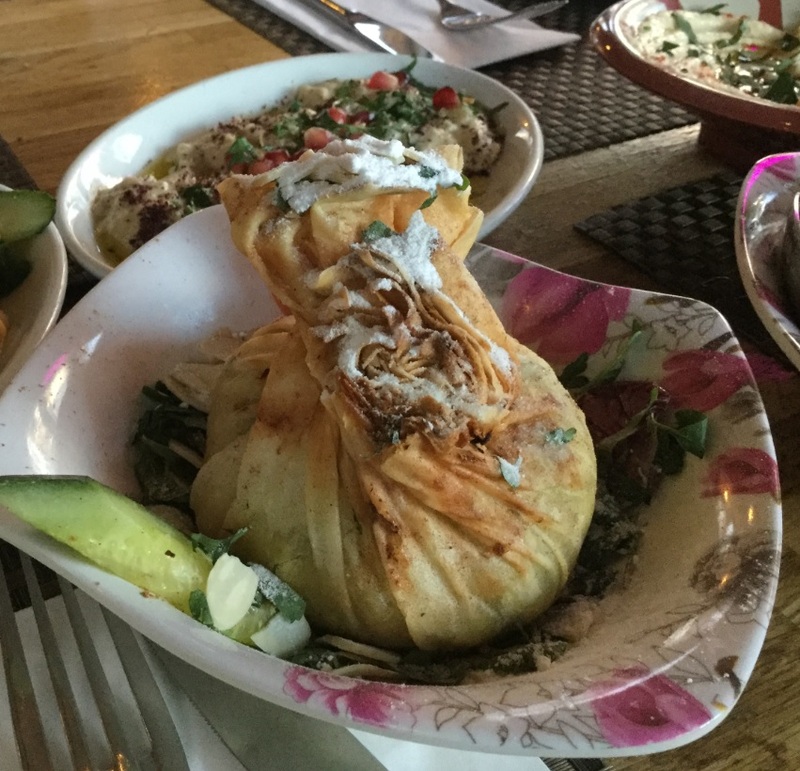 Majority of the dishes were vegetarian and suitable for me except the Pastila Djaj, a chicken pie that my friends vouched for saying it was exquisite!! These photos of the Meze will definitely make your mouth salivate. 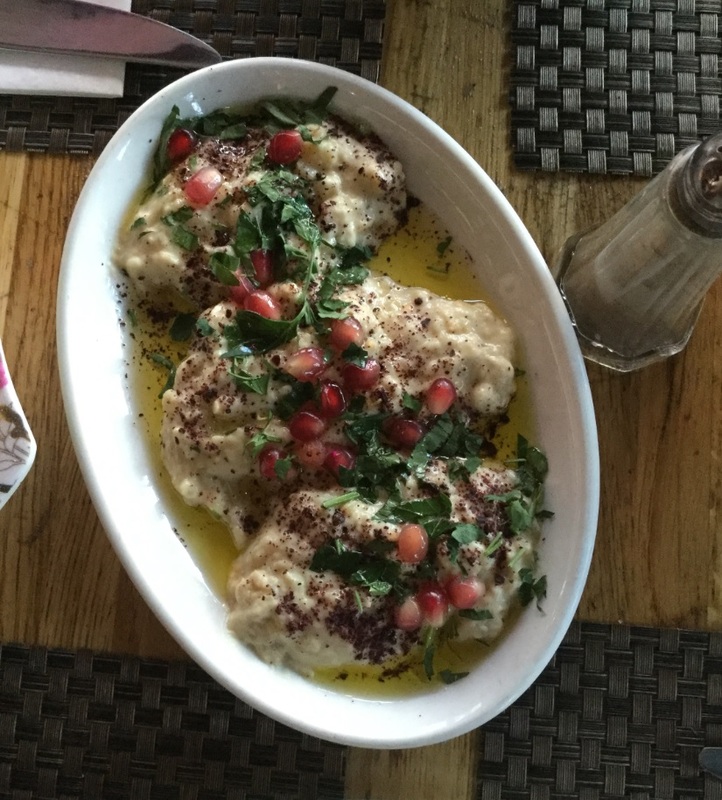 Baba Ganoush-Chargrilled aubergine, mashed and cooked with tahini, olive oil, and various seasonings. Lebenese feta cheese rolled inside this phyllo pastry and deep fried until golden. 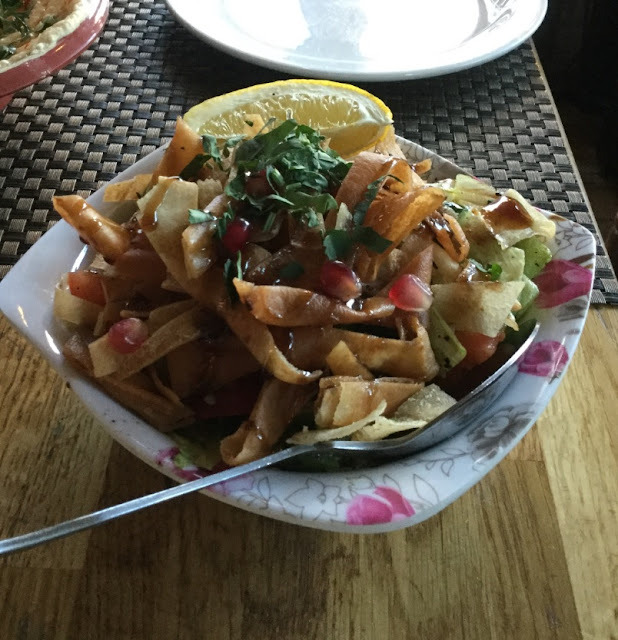 Fattoush- Mixed fresh salad with herbs and toasted Lebanese bread. This was by far my most favorite meze dish and I could have eaten it as astand alone dish. Pastila Djaj- Traditional Moroccan chicken pie encased in phyllo pastry and brushed with almonds saffron, cinnamon and a dusting of sugar. 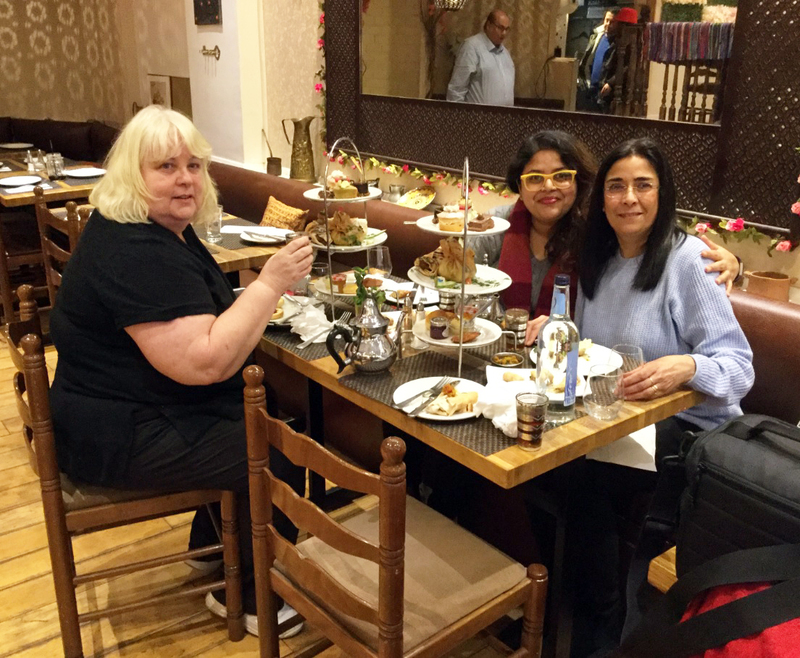 After sampling a wonderful selection of Meze, whilst sitting in the conservatory part of the restaurant, we were later relocated to the inside of the restaurant to a gastronomical surprise for the grand afternoon tea. An array of cakes and wraps and cakes and more mint tea followed. 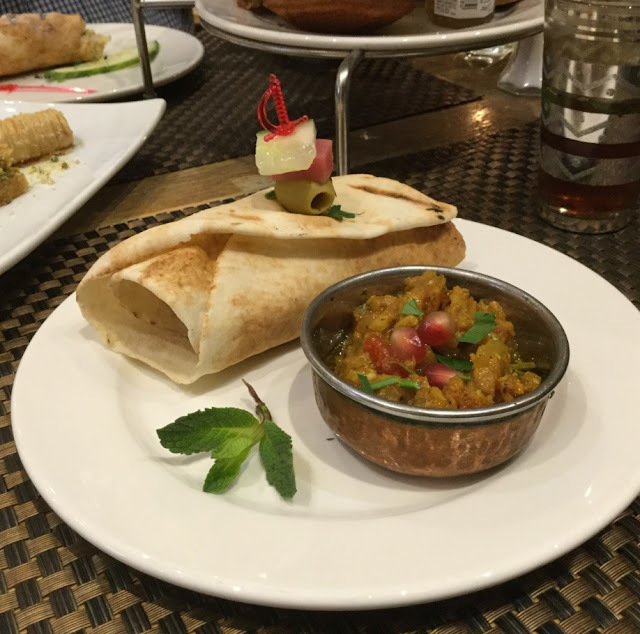 For the vegetarian option I enjoyed Falafel wraps with Zaalouk an eggplant dip cooked with tomato and spices whilst my two friends enjoyed the Chicken Shawarma wrap and Pastila Djaj. After the savory delights we moved onto the cakes and pastries. I started off with the Pistachio cupcake with pistachio butter cream topping, It was absolutely delectable. The feasting continued with more sweet treats such as Argan delice slice with date and pistachio, this had a lovely praline base followd with sweetened coconut, topped with pistachio and date achocolate mousse and a chocolate ganache. It was an explosion of flavours and textures in one mouthful.The Victoria sponge with pomegranate was simple and very classic, and finally the Rosewater Mohalabia, creamy set custard with hint of rose, personally I would have liked more rose flavour in it. 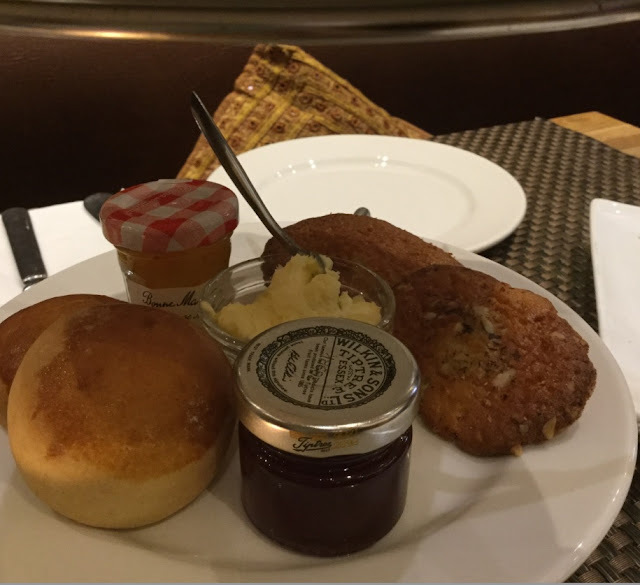 When we thought our stomachs were ready to pop there were still warm cinnamon scones and jam with clotted cream to devour. 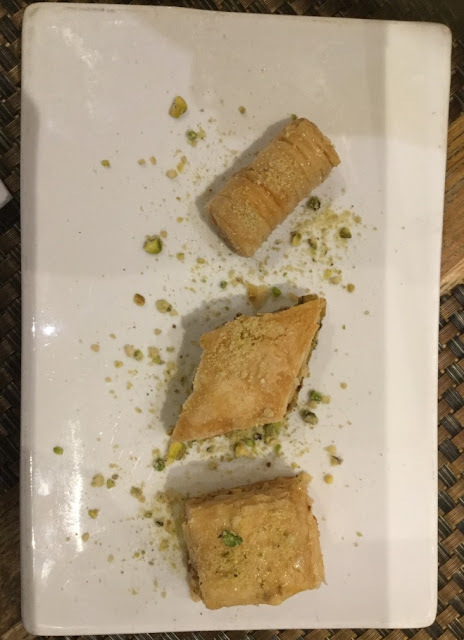 Finally no Moroccan meal is complete with out the Baklava, crispy pastry with a honey and nut filling. The was simply the icing on the cake to complete the amazing afternoon tea experience. Each and every item was beautifully presented and served and tasted scrumptious. I was a guest at the Leila to sample their afternoon tea with my two friends Heidi and Manjiri. I must sat the ambience, the decor and the service were exceptional. 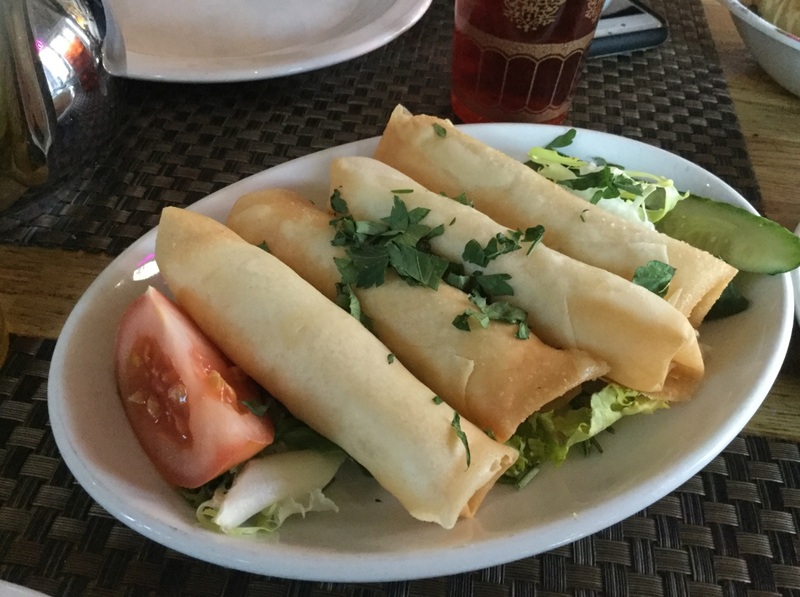 The only criticism I have is that it would have been more appropriate for the restaurant to place the vegetarian wraps on a separate platter instead placing them next to meat ones as a strict vegetarin might find this a problem. Also the victoria sponge cake and the scones were a little dry but the restaurant soon corrected that by bringing a fresh batch out. We also learnt that Leila will be offering oroccan cookery classes soon, I am excited to attend them. I would definitely dine at this restaurant again.